As you can see from the chart below, the NDR Sentiment Composite is at 66.67 which signals the market is exhibiting excessive optimism. When this index is above 62.5, the returns per year are -8.84% since 1994 and -2.07% since 2014. Furthermore, the CNN Fear and Greed index is at 61 out of 100 which signals greed. One other point worth noting is some traders may view good economic news as bad news because the Fed could get more hawkish. On the other hand, low inflation indicates we could be entering a Goldilocks period for stocks as the Fed doesn’t need to raise rates and growth is solid. This point explains why the S&P 500 had its greatest January since 1987 and why stocks can have a solid rest of 2019. The point of this article is to give an overview of all the great economic reports that came out on Friday. We will give more detail on the January labor market report in subsequent articles. For now, you need to know the headline number for job creation was significantly above estimates. As the chart below shows, 304,000 jobs were added which beat estimates for 158,000 jobs. This is consistent with the strong jobless claims report outside of the last week of data. The worst part of the jobs report is the great December reading was partially taken away as the report showed 222,000 jobs were created instead of 312,000 jobs. At least the November reading was revised higher by 20,000 jobs. Don’t fear the increase in the unemployment rate from 3.9% to 4%. It was up because of the government shutdown and because previously discouraged workers entered the labor market. The U6 unemployment rate, which includes the underemployed, was up from 7.6% to 8.1% because the government shutdown caused some people to look for part time work. The good news is the labor force participation rate increased from 63.1% to 63.2% which broke out of the range from 62.7% to 63.1% that it was in from 2014-2018. Discouraged workers continue to come off the sidelines which is boosting the supply of labor. The biggest miss was that monthly average hourly wage growth was 0.1% instead of 0.3%. However, yearly growth and the average work week met estimates for 3.2% and 34.5 hours. Overall, this was a great report which doesn’t jive with the narrative that growth is slowing. Monthly construction spending growth in November was 0.8% which beat estimates for 0.2% growth. Yearly growth was 3.4%. Residential construction was up 3.5% monthly, but only 0.8% yearly as the housing market was weak at the end of 2018. Non-residential construction was the opposite as monthly growth was -1.2% and yearly growth was 4.2%. Commercial and office building were weak. For all those wondering if the government will pass an infrastructure bill aimed to stimulate the economy, you may be interested to know public construction spending growth has been great. Spending on transportation, educational buildings, and highways and streets were up 7.6%, 8.5%, and 5.8% yearly. 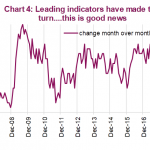 The consumer sentiment report was the only report we’re reviewing in this article which missed estimates, but it still improved from the initial reading. It increased 0.5 to 91.2 which missed estimates by 0.2. We’re looking for this January reading to be a temporary blip lower caused by the government shutdown. The orange line in the chart below shows the global manufacturing PMI fell from 51.4 to 50.7. This was a 31 month low. Without America, the index would have been 50 which indicates no growth. The Euro area hit a 50 month low (50.5) and Japan hit a 29 month low (50.3). Italy was the worst in Europe as its PMI fell to 47.8 which is the lowest in 68 months. China is in rough shape as its PMI was 48.3 which is the lowest since February 2016. China should be very motivated to make a trade deal with America. The only encouraging part of the global IHS report was the future output index which increased from 58.8 to 60.7. Both the chart above and the one below, which shows that American manufacturing’s relative strength versus European manufacturing is near previous peaks, use the ISM PMI, so let’s review that report. The Markit PMI was consistent with 2.5% GDP growth and the ISM report is consistent with 4% GDP growth. The ISM PMI was up from 54.3 to 56.6 which beat estimates for 54. 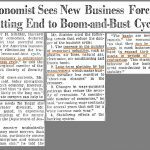 Economists saw a slowdown, but growth accelerated. The new orders and production indexes were up 6.9 and 6.4 points to 58.2 and 60.5. The prices index fell 5.3 to 49.6. This signals prices aren’t increasing. That could mean inflation is contained and the Fed doesn’t need to hike rates. It’s the ideal Goldilocks scenario. The economy was inundated with great economic reports, but stocks were overbought so they didn’t rally. That doesn’t make the data useless. It supports the narrative that amid a global slowdown, the American economy’s slowdown barley exists. 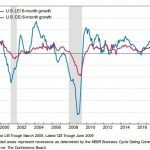 Growth may be re-accelerating. If that is the case, combining that with low inflation and a dovish Fed could be a positive catalyst for further upside in equities. PreviousIs The Economy Telling Us Something New? 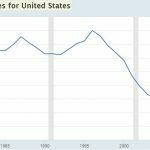 NextLabor Market Running Out Of Supply?